The upper part depicts a process diagram of a gas-powered steam boiler system. Below are the energy flows as a Sankey diagram. Values are in percent, showing the yield. 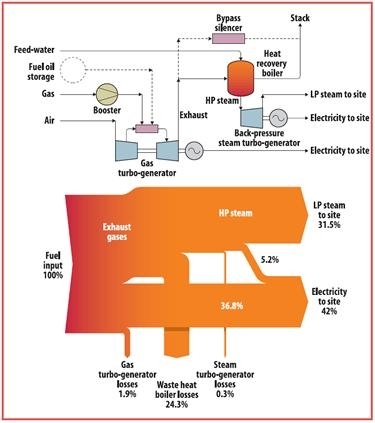 Out of the input energy (100%) we have 31.5% of the energy in low presseure steam and 42% in electric energy. Don’t know where I picked this duiagram from, will have to check if I find the source of this.